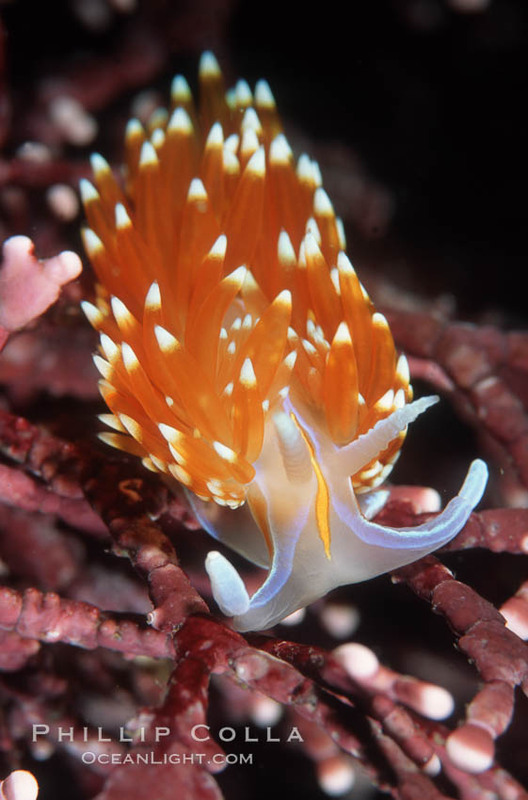 This photo of a Hermissenda crassicornis, also known as an “Opalescent nudibranch”, was shot in the early 90’s near Carmel on the Monterey Peninsula. We rented a house in the town of Carmel for a week. Anticipating foggy skies and cold murky water, we did not expect to do much diving. However, surprised with sunny weather and clearer-than-normal water, we made a number boat dives and a few beach dives not far from the house, resulting in a nice variety of invertebrate images including some nudibranchs. This is one of those images. The Sea Slug Forum has a great fact sheet page on this species. Also, the SlugSite has an excellent species description of Hermissenda crassicornis. Keywords: nudibranch photo, sea slug, Hermissenda crassicornis, underwater, photograph, Monterey, California, Carmel.